The forest green Lens Cover for the Canon 600mm f/4 IS Lens from LensCoat covers the lens with a 100% closed-cell neoprene coat, offering protection from bumps, jars and nicks. 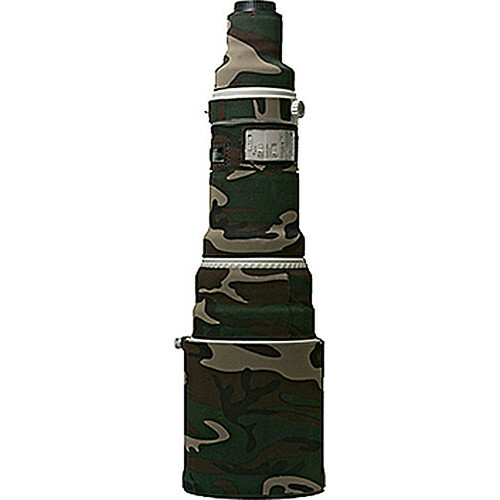 This cover allows you to blend in with your surroundings, making it useful for nature and outdoor photographers, sports shooters and photojournalists. This classic forest green Camouflage pattern is useful for when shooting in wooded areas. A LensCoat Lens Cover also provides a thermal barrier, protecting your hands from the cold lens surface in lower temperatures. It is easy to install and remove, leaving no residue on the lens. It is also waterproof, providing protection in harsh conditions. Box Dimensions (LxWxH) 12.5 x 8.5 x 1.0"
Lens Cover for the Canon 600mm f/4 IS Lens (Forest Green) is rated 4.7 out of 5 by 21. Rated 5 out of 5 by Montana from Best protection I have found I bought this product for my Canon 600mm f/4 IS. My first thoughts were to keep this very expensive lens looking great for years to come. I always take the best of care with my gear. I also do a lot of birding/wildlife photography, so the camo is a plus in hiding this monster of a lens. The fit is very decent, but it makes storing the lens in the factory hardcase very difficult. Also, the lens cover (facory model) doesn't play nicely with the lens coat. I would recommend purchasing a hoodie lens coat. Rated 5 out of 5 by Anonymous from Lenscoat For Canon 600mm f/4 Lens As a publisher and professional photgrapher shooting Canon exclusively, I find Lenscoat to be an excellent product. Lenscoat is durable to say the least. I like the snug fit to my lens. The use I give my camera equipment is extreme. I have traveled the world shooting everything from action sports to wildlife. Lenscoat does an excellent job of protecting my lens from the shock of travel and prevents scratches to the painted finish. The cammo pattern helps when shooting wildlife. There are not many drawbacks to this product. The window make it difficult to shift the controls on the lens. It would be an improvement if Lenscoat could come up with a remedy for that. As it is I have punched small holes in the window for ease of control over the buttons on the lens. Mike Summers / Ultimate Exsposure Photography. Rated 5 out of 5 by SiriusDoggy from Great protection I purchased this cover mainly to protect the body of the lens since the lens is a loaner from a friend. The fact that it's camo is just a plus since I'm taking it on a safari in a couple weeks. It's a bit tough to get on but that's probabaly a good thing. You don't want it slipping and sliding around once it's in place. My only complaint is that it's now more or less impossible to get it back in the Canon provided hard case. Rated 4 out of 5 by lorendn from Great insurance I put the LensCoat cover on my 600mm, not to avoid scaring the wildlife, but to protect my multi-thousand dollar investment. It amazes me that when people look for used lenses, cosmetics mean a lot. It seems that the LensCoat is a great way to protect from those small bumps and nice that happen every day. Easy to install - worth the investment. Rated 5 out of 5 by Anonymous from I would recommend this item to a friend. Most importantly the lenscoat will protect your lens from scratches and helps somewhat to provide additional protection from rain or snow. Camouflage is better than a white lens, unless you are photographing in a snowstorm. Make sure you order the right item as there are different product items for each version of the 600mm lens. Rated 5 out of 5 by Juan Carlos from A necessity in the rain forest! I just got one of this for my 600f/4 and couldnt be happier! It not only protects my gear (which will add greater value when I sell the lens) but also helps me so birds dont get so skittish. Shooting in the rain forest with one of this makes for the perfect blend and really disguise my rig while in the forest. Rated 4 out of 5 by Charlie from 1 day and already modified I use manual focus frequently when shooting song birds. I keep my left hand on the tripod head with my finger tips over the focus ring. I depress the shutter half way and use my fingertips to move the focus ring to fine tune the autofocus. With the lens cover over the focus ring, there was not enough friction to focus easily with just my fingertips. To resolve the issue, I cut a strip of the spine side of heavy duty adhesive-backed velcro and attached it to the outside of the focus ring cover. The down side is that if I ever have to remove the focus ring cover, I will have to remove the velcro and may damage the outside of the cover doing so. The standard lens shade hood fits very tight with the lens cover on the lens shade. Latching the lid on Canon's Case 600 is even more challenging than it was when the lens was new. I am very pleased with the quality of the cover. The birds will not react as much as they did with the white lens sticking out of my portable blind. Rated 5 out of 5 by Jim Z from Must have accessory After spending over $7,000 on a lens this is such a minoryet important accessory that it would be plain silly not tobuy it. It will pay for itself many times over in resale aswell. Just buy it! Expertise: Publishing wildlife images for almost 30 years. Problems Encountered: None! Does this fit the 600 f4 IS II as well?